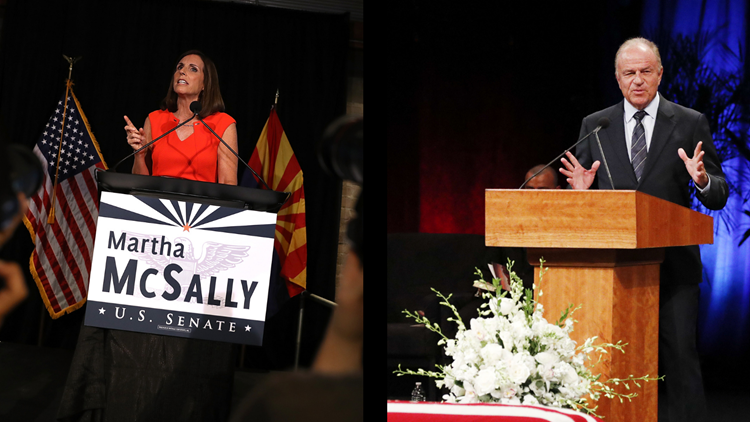 It's 2020 in Arizona: Can McSally win, will Woods run? Political insiders say Woods faces obstacles and McSally must recover from 2018. Arizona's historic 2018 U.S. Senate race is over and it appears the 2020 election is already here. On this weekend's "Sunday Square Off," Republican and Democratic political insiders discuss the early line on a 2020 election that's shaping up as another expensive battleground race. How does Martha McSally win after narrowly losing a bitter 2018 race to Democrat Kyrsten Sinema? Arizona Gov. Doug Ducey appointed the GOP congresswoman to the U.S. Senate last week. High-ranking Arizona Republicans blame Martha McSally's out-of-state campaign manager for mishandling her race, but also say McSally needs to do some soul-searching about what went wrong. Can former Republican Attorney General Grant Woods win a Democratic Senate primary? Grant Woods has been swept up in a wave of adulation since his moving eulogy last August for close friend Sen. John McCain. Wood registered as a Democrat three days after the November election. He plans to decide on a 2020 run early in the new year. Democratic insiders warn that Woods' record— including his co-chairmanship of Gov. Jan Brewer's election campaign in 2010, the year she signed SB 1070— would be deal-breakers for primary voters. Other Democrats are also considering a run: Congressman Ruben Gallego and Gabby Giffords' husband, former astronaut Mark Kelly. Joining me on "Square Off" are Kim Owens, executive director of the Dodie Londen Excellence in Public Service Series, a leadership program for Republican women; and Lisa Fernandez, a Democratic political consultant and vice president at Resolute Consulting. "Sunday Square Off" airs at 8 a.m. Sundays on 12 News, after NBC's "Meet the Press," with Chuck Todd. Can McSally recover from bruising election? Now that she's been appointed to the U.S. Senate, how does Republican Martha McSally bounce back to win the 2020 Senate election after narrowly losing a bitter 2018 race to Democrat Kyrsten Sinema? Will Woods run for Senate as Democrat? Can former Republican Attorney General Grant Woods win a Democratic Senate primary? Woods registered as Democrat just seven weeks ago. Democratic insiders warn his record could be a problem in a Democratic primary. Watch videos from previous "Sunday Square Off" shows here.